Beacon House Inn is a nostalgic hotel near Wilmington. The former boarding house has been transformed into a classic inn comprising a lot of luster and luxury. The celebrated beach of Carolina is just at a stone’s throw from the hotel and the windows and balconies open to the vast beauty of the ocean. Situated in a convenient location, Beacon House is twenty minutes away from the Wilmington Airport. 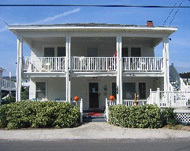 The hotel rooms feature cable television and complimentary wireless internet access. The hotel lobby features a fireplace and there are barbeque grills and refrigerators in the public areas. Fort Fisher and the Aquarium are only 2 miles away and the beach is just across the street.